Andhra Pradesh Public Service Commission (APPSC) has invited applications for recruitment of Panchayat Secretary (Grade-IV) posts. The last date for submission of applications for the post of Panchayat Secretary (Notification No. 13/18) is extended up to 26/01/2019 (Note: 25/01/2019 is the last date for payment of fee up to 11:59 mid night). The APPSC Panchayat Secretary registration process started on December 27, 2018, and the last date of registration is January 19, 2019. The APPSC is conducting this recruitment drive to fill 1,051 Panchayat Secretary (Grade-IV) posts. The screening test for recruitment of Panchayat Secretary posts will be conducted on April 21, 2019. The APPSC Panchayat Secretary Main exam will be held on August 02, 2019. The APPSC Panchayat Secretary 2019 hall tickets/ admit cards will be made available on the official website of the Commission. The date of availability of APPSC Panchayat Secretary 2019 hall tickets is not released as of now. The candidates, if selected, will get a pay scale of Rs 16,400 â€“ Rs 49,870. The candidates are advised to check the official website for more details. Attention:- Revised Exam Scheduled in Assistant Executive Engineers - Notification Nos.09/2018 - Screening Test to be held on 17.02.2019 instead of 10.02.2019 and The Main Examination will be as scheduled on 1st and 2nd April 2019. 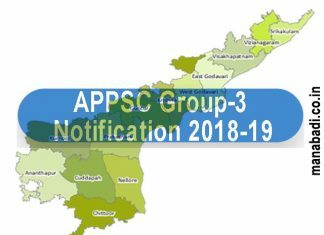 Andhra Pradesh public service commission has finally announced Recruitment notification for APPSC Group 3 Notification 2018 i.e Panchayat secretary (grade â€“ iv) in a.p. panchayat raj subordinate service. Applications are invited through Online for recruitment to the post of Panchayat Secretary (Grade â€“ IV) in A.P. Panchayat Raj Subordinate Service.the detailed notification will be releasing on 21-12-2018. 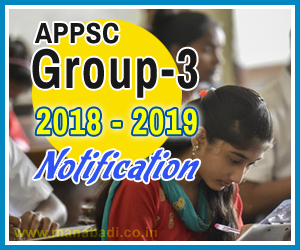 Here we are providing the complete information regarding Notification release date, eligibility, selection procedure, exam pattern and syllabus for the candidates who are preparing for Group 3 (Panchayat Secretary) Examination. For applying to the post, the applicant has to visit www.manabadi.com and we will redirect to the appsc official page and click the corresponding link given there or alternatively use the URL http://www.psc.ap.gov.in to directly access the application. The objective type question papers are to be answered on computer system. Instructions regarding this computer based recruitment test are detailed in the Annexure â€“ III. MOCK TEST facility would be provided to the applicants to acquaint themselves with the computer based recruitment test. Applicant shall visit the website and practice the answering pattern under MOCK TEST option available on main page of website www.psc.ap.gov.in or http://appscapplications17.apspsc.gov.in. HALL TICKETS can be downloaded 7 days before commencement of Examination. Age as on 01/07/2016 Min. Max. iv. He/ She is a citizen of India: Provided that no candidate other than a citizen of India may be appointed except with the previous sanction of the State Government and except in accordance with such conditions and restrictions as they may be laid down. Such sanction shall be not be accorded unless the State Government are satisfied that sufficient number of citizens of India, who are qualified and suitable are not available. Must have passed the Degree from any University in India established or incorporated by or under a Central Act, State Act or a Provincial Act or an Institution recognized by the University Grants Commission. No person shall be eligible for direct recruitment if he/she is less than 18 years of age and if he / she is more than 42 years of age as on 01/07/2018 as per G.O.Ms.No.132,GA (Ser-A) Dept., dated:15.10.2018. Candidates should not be born earlier than 2nd July 1976 and not later than 1st July 2000. 3 Ex-Service men Shall be allowed to deduct from his age a period of 3 years in addition to the length of service rendered by him in the armed forces / NCC. 5 A.P. State Government Employees (Employees of APSEB, APSRTC, Corporations, Municipalities etc. are not eligible). Up to a maximum 5 Years based on the length of regular service. Social- economic and political history of modern India with emphasis on Andhra Pradesh. e-governance initiatives with specific reference to Andhra Pradesh. Physical geography of Indian sub-continent and Andhra Pradesh. Application of Remote Sensing and GIS in the assessment of Disaster. 3 Ex-serviceman and Serving persons of the Armed Forces of the Union 3 years & length of service rendered in the armed forces. 4 N.C.C (who have worked as Instructor in N.C.C.) 3 Years & length of service rendered in the N.C.C. NEGATIVE MARKS: As per G.O.Ms. No.235, Finance (HR-I, Plg & Policy) Dept., Dt.06/12/2016, for each wrong answer will be penalized with1/3rdofthe marks prescribed for the question. As per G.O.Ms. No.235, Finance (HR-I, Plg & Policy) Dept., Dt.06/12/2016, for each wrong answer will be penalized with 1/3rd of the marks prescribed for the question. I STEP: The Candidate after satisfying himself/ herself about the eligibility criteria for the notification shall pay fee through corresponding notification Online Payment Form. â€¢ At the payment Gateway the candidate has to give his/her Basic Personal Details such as Name of the candidate, Date of Birth, Gender, whether the candidate belongs to Andhra Pradesh State, community, Mobile Number etc. Candidate should enter his/her particulars i.e. Name, Father Name, Mother Name & Date of Birth as per his/her Secondary Education Board Class X Certificate. On receipt of fee at Payment Gateway, the candidate will be issued a â€œJournal Numberâ€� with which he / she can proceed with submission of Application online. Issue of Journal Number does not mean that the candidate has completed the submission of application online. It is only a confirmation of the fee received. II STEP: After payment of Fee the Applicant should visit Online Application Form Submission link and enter the Journal Number, Date of payment and Date of Birth to get and fill the format of Application and should submit ON-LINE. IV STEP: The applicants have to invariably fill all the relevant columns in the Application and should submit ON-LINE. All the candidates are requested to submit their application with correct data. Applicants willing to serve anywhere in Andhra Pradesh should alone apply. his/her eligibility for this examination. However, the following categories of candidates are exempted from payment of examination fee of Rs.80/- only. â€¢ SC, ST, BC, PH & Ex-Service Men. â€¢ Un-employed youth in the age group of 18 to 42* years as per G.O.Ms.No.439, G.A. (Ser.A) Dept., dated: 18/10/1996 should submit declaration at an appropriate time to the Commission. â€¢ Applicants belonging to the categories mentioned above (except Physically Handicapped Persons & Ex-Service Men) hailing from other States are not entitled for exemption from payment of fee and not entitled for claiming any kind of reservation. i) The Fee mentioned in the above paragraph is to be paid through Payment Gateway or Net Banking/ Credit card /Debit Card. The list of Banks providing service for the purpose of online remittance of Fee will available on the website. ii) The fee once remitted shall not be refunded or adjusted under any circumstances. Failure to pay the examination fee and application fee (in non â€“ exempt case) will entail total rejection of application. How to get ready to appear for APPSC Group 3? Plan how to prepare for the exam. 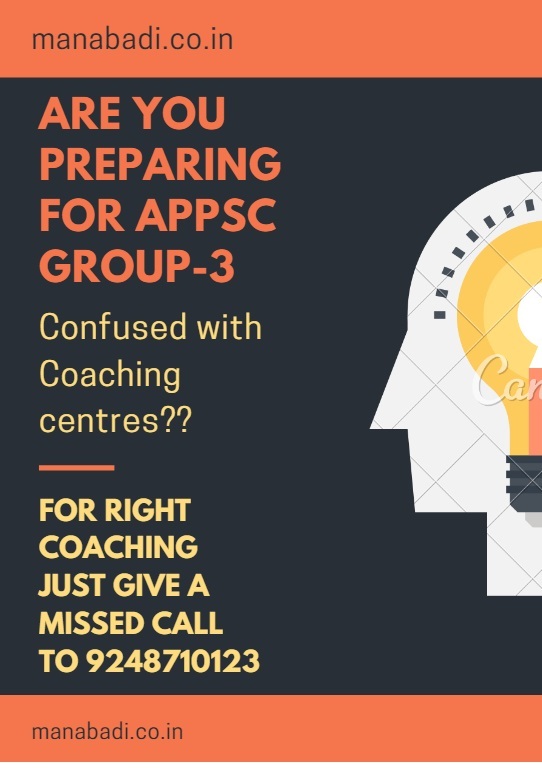 Once the APPSC Group 3 Notification 2018 for AndhraPradesh (AP) state is released you will be left with very little time for preparation. So prepare a Plan of preparation accordingly. Well it is the very common question for all aspirants. There are many institutes which provide training, but the thing which matters is how best you are extracting from them. You have to listen them carefully, prepare yourself notes and start getting prepared. We also suggest to go for Group 3 Online Coaching even if you are going to training institute. APPSC Group 3 coaching. It is the best APPSC Group 3 online coaching in this Online coaching you can view video classes through internet. Even if you don't have internet you can view videos through pendrive. The pendrive can be attached to your mobile. Wonderfull ....good information we are getting..
good information. Thank you sir. Thank You So Mutch Sir Good Information ..Ap Governmmete......! VALUABLE INFORMATION SIR. THANK YOU SIR. everything was fine,and thanks for the good information.. but im disapointed for the reservation tem in india.not only me sooo many persons are suffering with this reason only.. my only request to the government is dont estimate the person talent with the reservation tem. i woukld like tell u one thng only, all OC,BC candidates are not rich,and all sc,st are not poor.pls understand our problem,pls the candidates with the merit list only,not for the reseravtion tem..